I am not a Mom, but I have 2 Moms in my life that rock my world! I want to share something about each of them this Mother's Day. Tricia is my wife and the wonderful mother of our son Davis! This morning, she preached the Mother's Day message with me at church!! Yes, you read that right. We team taught a message called "Hats Off" out of Proverbs 31. Hats off for the job well done. 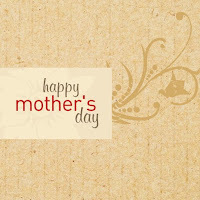 And hats off..and on and off and on...it is the story of every Mom that is breathing. You wear many hats with care and dedication and we thank you! Happy Mother's Day, Tricia! You did a fantastic Job today and you looked amazingly hot!!! Second. many of you know that I am a list person. Well, ever since the first time I ever preached as a teenager, I began keeping record of when, what and where I preached. To date, I have a log of every message I have ever preached. It is now almost 10 pages long. This morning, I preached my 200th sermon. My mother, Pam Kaye is the other special mother in my life...this mother gave me life. She has been a HUGE encourager in my call to ministry. As a result, I dedicated this mornings sermon to her (#200). Happy Mother's Day, Mom!